Since market introduction in mid-2002, patented Eco-Tech 14V high amp Alternators have been installed and used successfully by both original equipment and aftermarket fleet operators. Eco-Tech Alternators provide superior high output at idle performance (80% of rated output at idle) and unmatched efficiency have been experienced in diesel powered military boats; fire trucks; ambulances; utility company bucket trucks; school, shuttle and party buses; commercial fishing boats, and other applications where significant operating time at idle occurs at low engine speeds. 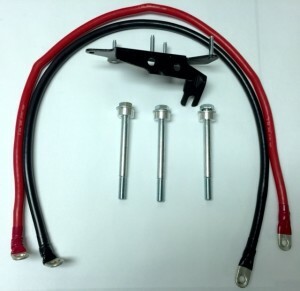 Eco-Tech Small parts kit for installation for T mount alternators for Ford E model pickups with 7.3L diesel engines.